Well, what can be said about that then? Arsenal go to Wales to take on a promoted team and come away with no points. It's thoroughly depressing. Credit has to be given to Swansea, they deserved the win. We didn't do enough to capitalise on the chances we created in front of their goal and at the end of the 94 minutes paid the price. There was also some woeful defending. Granted, there was no way the penalty should have been given. But on watching it at full speed during the game, it looked like a spot kick. Slowed down on TV replays at half time, it's clear for all to see that Nathan Dyer had stood on Ramsey's leg. Yes, the referee got it wrong but then so would many of us in the same position. 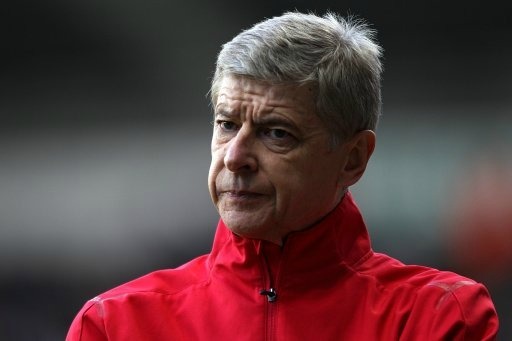 Arsene Wenger was forced into making three changes from the team which lost at Fulham. The injured Mikel Arteta was replaced by Yossi Benayoun, Ignasi Miquel came in for Francis Coquelin and Andrey Arshavin replaced Gervinho, who's at the Africa Cup of Nations. We took the lead after just four minutes. Alex Song passing to Arshavin in the middle of the Swansea half. The Russian found Robin van Persie who dummied before shooting past Steven Caulker and Michel Vorm. It was a wonderful finish from a tight angle and the 22nd goal of the season for the Dutchman. The home side were level with their 16th minute penalty. But their work rate and excellent passing game from the moment we scored showed we were in a game. Remember, the Welsh team had lost just one game at home prior to our visit and conceded just four goals. It was down each flank where Brendan Roger's men were making the most of our lack of recongnised full backs. Ignasi Miquel and Johan Djourou being put to the test by the tricky Dyer and Scott Sinclair. It was telling that by half way through the first half, seven Swansea players had completed more passes than one Arsenal player. It really showed we were being dominated in possession and that's not something we as Arsenal fans have come to expect. At half time the scores were level, but we appeared to come out to start the second half with fire in our bellies. Dyer put the home team in the lead after our defence was caught all over the place.Ramsey was dispossessed, Miquel was caught out of position and no one was covering the left back slot and Dyer was left with the space and time needed to beat Szczesny. Within five minutes Wenger made a double substitution with Arshavin and Benayoun replaced by Henry and Rosicky. And inside six minutes we were level. Djourou releasing Walcott on the right, the England man raced through and lifted the ball over Vorm to put us back on level terms. Moments later the Gunners pressed the self destruct button and allowed the home team to take the lead for the second time in the game. Henry misplaced a pass and Sigurdsson played Graham into space down the left. Koscielny got the wrong side of the striker and Szczesny got all his angles wrong. It was easy for Graham to find the back of the net. We huffed and puffed in the final 20 minutes but I never expected us to score. There were too many players having average games yesterday. We didn't seem up for the fight. I don't know whether we went into the game expecting to win because we were playing a promoted team and a side we should be expected to beat, but I don't think the mindset was right. "The game was difficult because Swansea played well. It was also decided by some strange decisions from the referee, who gave a penalty that was complete imagination. "From then on I thought there were some odd turning points, like when we came back to 2-2 and made a defensive mistake straight away. It looked similar to Fulham to me, the lack of appreciation for the ball. Our defensive performance was not good enough and that's why we lost the game. "When we got back to 2-2 I thought we could win the game because I thought we could be dangerous. The keeper kept them in the game after too and made some great saves. "I think we also missed some unbelievable chances that are very difficult to understand and explain. But apart from that, well done to Swansea, they played well and deserved the win." We missed Arteta hugely. Without him in the middle of the park, making those simple but effective passes, it was clear to see by his absence that we weren't the most effective team. The other players we are clearly missing are recognised full backs. You can only go on for so long playing players out of position before they get found out. Djourou and Miquel are not full backs but tried their hardest to play those positions against tricky opposition. I don't think it is as easy as saying the manager should have gone out on January 1st and brought two players to play left and right back. That's far too simplistic. But playing without Sanga, Jenkinson, Gibbs and Santos through injury has cost us badly in recent weeks. Yesterday's result was down to individual errors. It was the third goal which was the final nail in our coffin. Henry misplacing a pass, Koscielny getting the wrong side of his man and Szczesny getting his angles wrong left Graham with an easy finish. Whilst I was concerned about our defence, I think up front we were awful. Benayoun and Walcott were pretty much anonymous, apart from his goal van Persie hardly got a kick and for all his work rate against Leeds, Arshavin didn't have the best of games. Ramsey didn't have his best of games, being asked to play deeper in midfield than usual and Alex Song was therefore under more pressure to perform. It's going to be a week of reflection. At the moment we sit four points off fourth place Chelsea and next weekend face Manchester United at the Grove. Two league defeats in Janaury wasn't how we expected to start the new year. A third consecutive league defeat would put us back in those dark August days. The manager has to take action. It's clear that even with Henry, scoring goals is still an issue. The Frenchman is only a short term solution and even when Chamakh and Gervinho return from the Cup of Nations, will we be any better off? Some really deep thinking for Wenger to do. He'll have to make some tough and ruthless decisions, but he has to - to ensure we finish inside the top four again come the end of the season.